When talking about Algerian food, one needs to bear in mind that it involves not just local cuisine of a certain state but culinary distinctives of Maghreb as a whole. Tunisia, Algeria and Morocco, situated in the very north of African continent, make for a political and cultural space that researchers refer to by the term “Maghreb”. This region is remarkable because it is closer to Europe than to some countries of the Dark Continent. Such location made an impact on both mindset of local citizens and cuisine that is a significant element of national character. 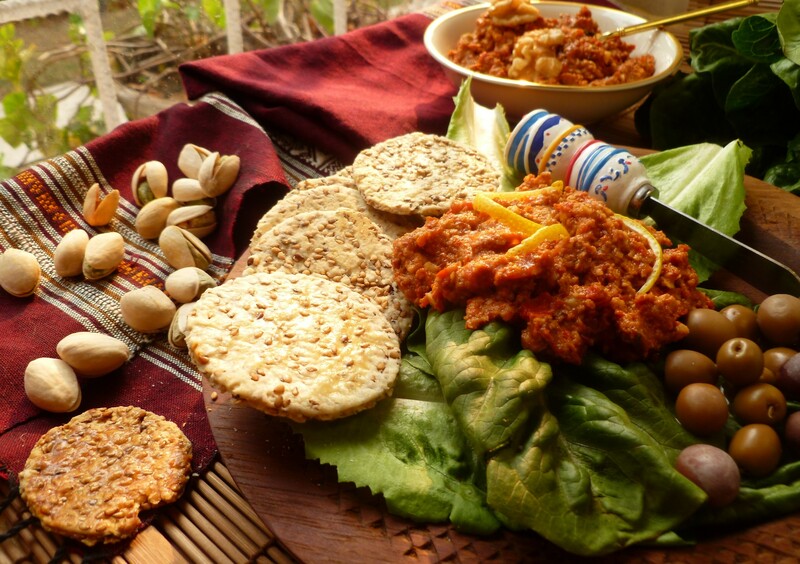 Sure enough, particular special dishes can be found in Algeria, typical for people of the place, but all in all food is similar in the region. They have a common trend of mixing African and European traditions. After Frenchman began playing a significant role in Maghreb, local bazaars got filled with such previously unknown products like, for instance, cauliflower and baguette that had for centuries been replaced with all kinds of flatbread. Several centuries later, nowadays, Algerian menu cannot be imagined without these items. Alongside European adoption cuisine, of the state tend to huge African helpings because problems of famine are an issue even nowadays so if dwellers of the Dark Continent sit down to table, they have to eat their fill because no one can be sure when such a chance comes next time. In first days of a visit, tourists get astonished with amount of food on plates; nevertheless very few fail to finish everything, because it is all so tasty and unusual. 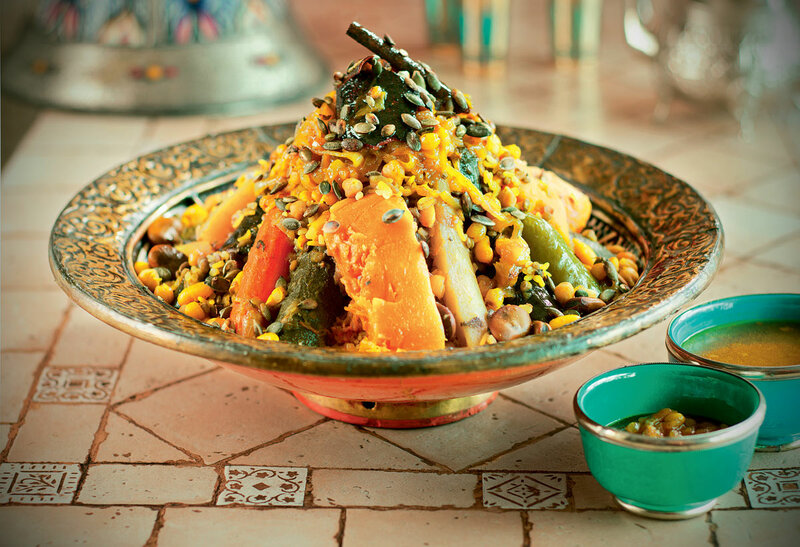 Major components of Algerian dishes are all kinds of spices and herbs. Ginger, anise, cinnamon, nutmeg, curcuma, coriander and caraway are not merely beautiful eastern words – these are ingredients that are must-have in every home. For all the spicery to be easily digested, Agerians drink plenty of mint tea, strong “Mauritanian” coffee that they consume together with grounds and simply water – its value cannot be overestimated for Africa. Interestingly, Maghreb tea urns, that decorate both cafés and ordinary apartments, resemble Russian samovars. In 19th century in times of endless Russo-Turkish wars shot-up tsarist ships sailed to African shores not to end up on hostile land. There they underwent repair and in the meantime both cultural and natural exchange between the Slavs and Africans took place. As a reward for help with mending, Russians told Algerian craftsmen how to make samovars. 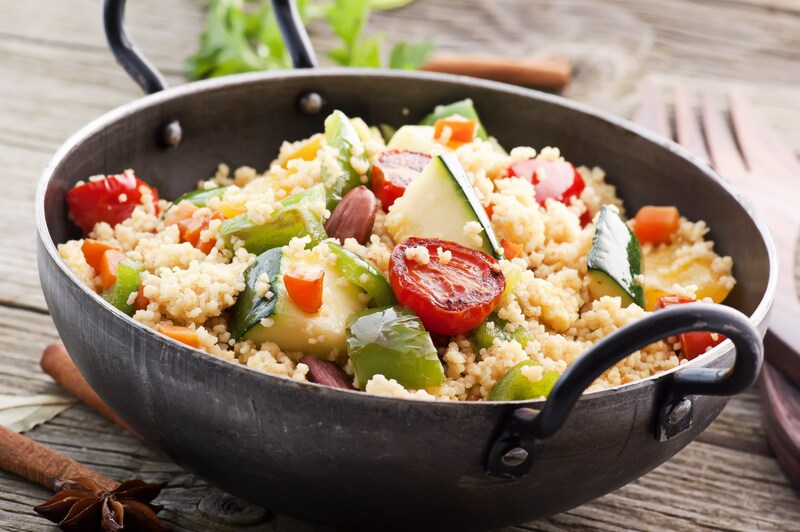 Main dishes are believed to be the following: couscous – wheat or semolina cooked by steaming with various additions, “tajine” meat ragout, “harissa” tomato soup, vegetables and eggs salad “shakshouka”, thick and rich country soup “chorba” and numerous variations of fried and stewed meat. Access to sea makes Algerian cuisine much richer compared to the rest of the continent. Alongside traditional legumes, vegetables and fruit a lot of fish and seafood is cooked in local kitchens and they almost equal to meat popularity-wise. Among desserts, dates in honey and cookies in syrup stand out together with the most popular sweet delight called “rfis” – airy cookies made of semolina to be washed down with kompot. It is so unlike European “analogs” - very thick, with nuts and wiped cream. Alcohol, as is the case with all Muslims, is very much out of favor – even if they drink it there, it is no more than a couple of glasses of local rose wine. Sure enough, there are extremely exotic hits of Algerian cuisine. For instance, jerked locust and camel meat. As a proof of such food being useful and proper, Maghreb dwellers like to cite Prophet Muhammad who once said: “He who never tried meat of camel and locust isn’t one of my people!” Locust is tenderly referred to in no other way but “shrimp of the desert” and as to digestion of camel meat in their stomachs they say this is “angels singing”. Today street food and fast food are in active blossom in the streets of Algeria. Altered in their own manner, cheburekki into “burek” and shawurma into “shawarma” are consumed by both local citizens and tourists. Everything tastes pretty familiarly, except perhaps a little too many spices. Slightly surprisingly, all kinds of transnational franchises of western fast food like McDonald’s or Burger King don’t take roots there at all – but if same hamburgers or French fries are cooked at a typical Arab kiosk, one will have too wait in line to get some – this is some sort of national quality seal. Almost every street dessert is French – waffles and pancakes with bananas, while ice cream is their own and very tasty, especially in resort cities. All in all, Algerians like to eat. It is indecent for their women to be slim therefore since ancient times they have held “feeding the bride” rite when teenage girls are prepared for wedding and are almost literally stuffed with flour balls presoaked in milk and oil as well as with other calorie-rich dishes. If a mother doesn’t have guts to make own daughter consume food in enormous quantities, she gives her child to another family and takes their daughter for this kind of “upbringing” in exchange. After all, the East is a delicate matter but no matter how you slice it, an incredibly tasty one!